Acoustic stethoscope, invented over 200 years ago by French physician, Rene Laennec, is the most commonly used medical diagnostic device and also the symbol of medical professionals. Thus, it might sound surprising, that the physics underlying the operation of this simple, mechanical device is still not well understood. The theory of operation of the stethoscope is widely described in the medical literature. However, most of the presented statements are based on purely intuitive conclusions, subjective impressions or on the results of experiments which do not reflect the complex mechanical problem of the chestpiece – patient interaction. Some recently published findings[1,2] suggest, that the state of the art in the field should be verified. One of the main challenges in determining acoustic properties of stethoscopes is the fact, that under patient examination conditions (i.e. the only case that actually matters for the considered problem) the chestpiece of the stethoscope is mechanically coupled with a body. The effects of this coupling significantly alter the sought parameters. 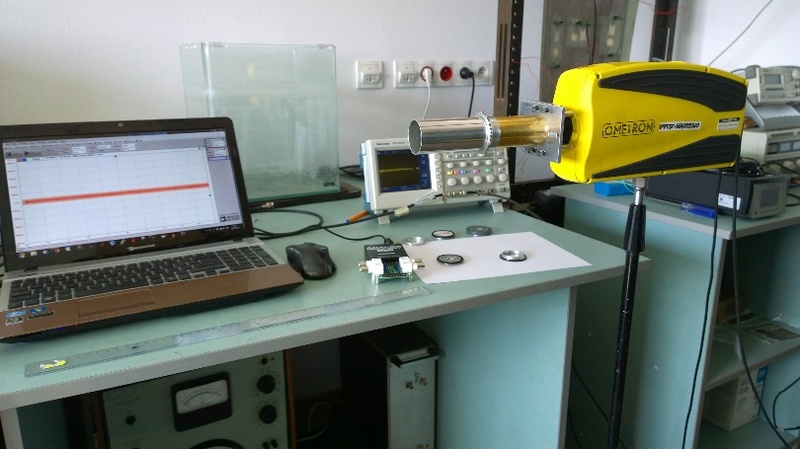 Thus, you cannot simply replace a patient with a loudspeaker, in order to use harmonic test signals, as in the normal case of measuring acoustic parameters of any standard audio device. You have to perform the analysis and draw the conclusions based on the sounds from the inside of the body of a patient, and those are relatively quiet, noisy, and variable in nature. The present study focuses on the role and function of the diaphragm in modern acoustic stethoscopes. During auscultation, the diaphragm is excited to vibrate by the underlying body surface, and thus it is the source of sound transmitted through the hollow tubes of a stethoscope to the ears of the physician. The higher are the velocity level values distributed across the surface of the diaphragm, the louder will be the perceived sound. Loudness is a crucial parameter, as the auscultation sounds are very quiet in general, and the diagnosis is often obtained based on the distinction of very subtle changes in those signals. 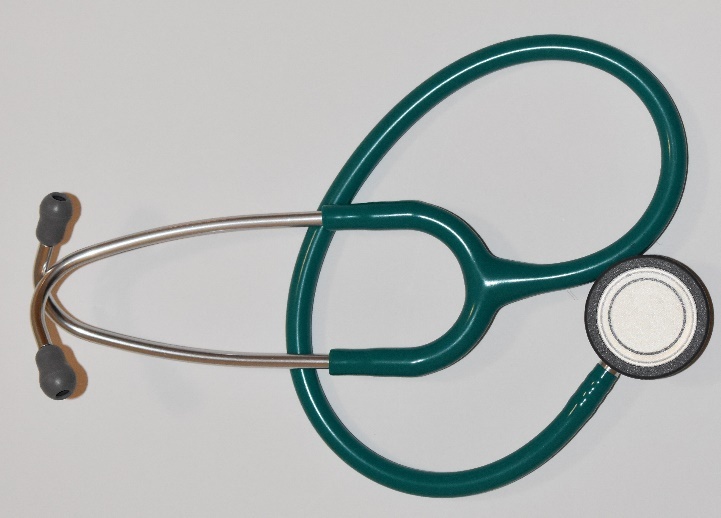 Different stethoscope manufacturers use various materials, shapes, sizes and attaching means for the diaphragms, claiming that specific solutions provide optimal sound parameters. However, no objective data regarding this problem are available, and thus, such statements cannot be accepted from the scientific point of view. 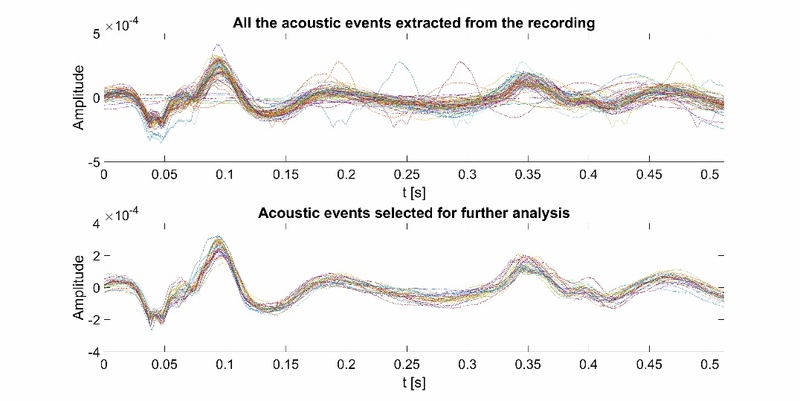 A detailed experimental methodology for determining vibroacoustic properties of different kinds of diaphragms is introduced in the present study. A laser Doppler vibrometer is used to measure the velocity of vibrations of various points on the surface of a diaphragm during heart auscultation (Figure 2). At the same time, an electrocardiography (ECG) signal is also recorded. The ECG signal is used to extract only a subset of clean and uncorrupted velocity signals, without noise and other, interfering body sounds (see Figure 3). The parameters of the extracted and selected fragments are statistically analyzed. The box plot in Figure 4 shows the values of velocity of vibrations determined at the center and close to the edge for various types of diaphragms encountered in modern acoustic stethoscopes. The first two boxes on the left correspond to the case without a diaphragm. In general, the higher values, and the lower differences between the center and the edge – the better. 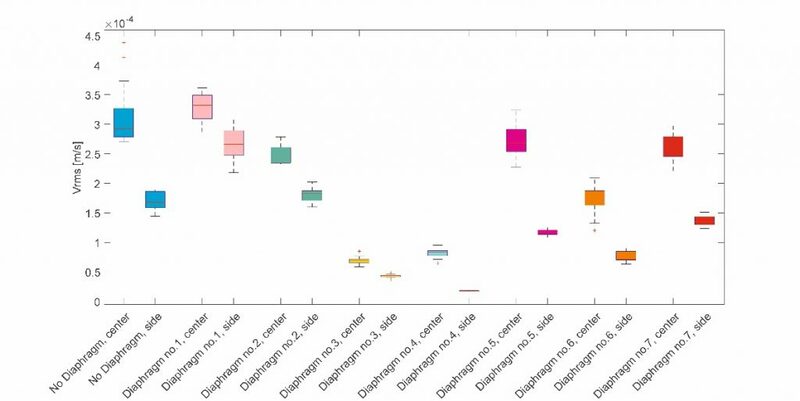 As it can be seen, the results differ significantly between various diaphragm types. The drawn conclusions are especially important from the physicians’ point of view, as the acoustic efficiency of a stethoscope translates directly into the quality of the diagnosis. An open question remains if and how it could be possible to significantly improve the efficiency of the existing solutions? The analysis of the obtained results states a good foundation for further investigations in this direction, as it allows to better understand the phenomena underlying auscultation examination and to formulate some general assumptions regarding the most promising solutions.